There's nothing more exciting than getting a new puppy. It's the start of a brand-new life together. You'll get to introduce him or her to your home and start training them to be the best dog they can be. However, for many owners, it's all fun and games until its time to go to bed. New puppies are notorious for spending the nights crying and howling. The deafening sound of canine wales can make any sane person want to rip their hair out. Not only is it difficult to sleep through, but it can be heartbreaking. No one wants to hear their new family member having a tough time. Our natural instinct is to go and provide comfort as soon as possible. However, doing so can only lead to problems in the future. You want to raise your puppy so that they become smart, independent, and obedient. A big part of that is to establish your training methods early on. If your new puppy won't stop crying in their crate at night, you need to be strong and take the reins so that you can stop the behavior as soon as possible. Before we get into why your puppy is crying, let's delve a bit deeper into the importance of crate training. Novice dog owners often make the mistake of taking the crate away altogether once the crying starts. It's an easy solution to a rather complicated problem. The pup is crying in his crate, so why not let him out so that he stops? This is one of the worst things you can do. Crates play a pivotal role in the training process and will be used in numerous applications throughout their life. Every time you take your dog on vacation or to the vet, they'll be placed in a crate. 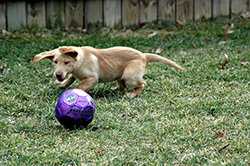 By skipping the crate training step altogether, you're taking away that valuable training tool. When they're ultimately placed in a crate as an adult, they'll become fearful, stressed, and possibly dangerous. Utilizing a crate early on will provide adequate exposure. Furthermore, the placement of your crate can desensitize them to things they'll hear as they grow. For example, many owners place the crate in the living room where they'll hear passing sirens, fireworks, noisy neighbors, and much more. This can help sensitivity issues in the future. While they may be scared at first, crates will eventually become a safe haven for your dog. Canines seek out warm and confined areas. When they're used properly, your new puppy will eventually love going to their crate at night. Why Do New Puppies Cry at Night? Now that we've established why you should avoid ditching the crate altogether, let's examine some of the many reasons why your puppy may be crying at night. Some owners compare the experience of having a young puppy to that of bringing a newborn baby home. Puppies are essentially baby dogs, so their needs and emotions are quite similar. Your pup's fragile emotions can keep them up at night. This is quite common in the first few weeks of being in their new home. When you adopt a puppy, you're separating them from their family and the environment that they have become accustomed to. They going through a period of adjustment to the new space. While they might be fine when you're in the same room, the feelings of anxiety creep up the moment that you leave. They're all alone in a new scary place, so they'll start crying to get you to come back. Puppies are just big bundles of energy. They can play for hours on end and still have the energy to stay awake. If your puppy keeps crying at night, they may be too riled up to fall asleep. It's important that you expend as much of their energy as possible before bedtime so that they won't have any problem taking a nap. Dogs typically learn to hold it in as they grow up. Young puppies don't have the muscle strength or knowledge required to do that yet. They'll need to be let out to relieve themselves at some point throughout the night. They don't want to urinate or defecate where they sleep, so they'll cry until you let them out. A young pup that's only a few months old can only hold their bladder for about three or four hours, so keep that in mind when you're planning a nighttime routine. Something as simple as not having a comfortable crate can lead to excessive crying. Choosing the right crate is very important for effective training. It should be large enough for them to stand up, turn, and lie down. However, a crate that's too large is scary and can lead to some issues. You should place an appropriately sized bed inside for comfort. Some other things you'll need to consider is placement and temperature. Small dogs can get cold pretty quickly, so avoid putting the crate next to an air vent. You should also position the crate in a corner of the room facing out so that they have full visibility of the area. You can also partially cover the top to create a comfortable cave-like feeling inside. If your puppy is scared of the crate, then they'll have problems being inside of it at night. This is a common issue for dog owners who use the crate as a form of punishment. Yelling at your puppy or forcing them to go to the crate when they get in trouble will make them associate it with bad feelings. * The crate should never be used for punishment. Instead, it needs to be a place of comfort. While the crying may be tough now, it's a pivotal time in your dog's training. There's a lot you can do to stop it and set your puppy up for success. A great way to prepare your pooch for a night of sleep is to take them for a healthy walk. A brisk walk around the block can get rid of all that pent-up energy they may have. It'll tire them out so that they can fall asleep quickly when it's time for bed. It's always a good idea to take puppies out prior to putting them in a crate anyway, so you might as well extend that activity and go for a full walk. As mentioned earlier, puppies can only go for a few hours without needing to be let out. While it may be a bit frustrating, you should wake up in the middle of the night to provide relief. It's better to prepare for a potty break than to be woken up by loud crying. When your alarm goes off, take your puppy out of the crate and to their relief spot. It's important that you don't make any big fanfare out of the event. If they were already crying, don't say anything to soothe them. You shouldn't even turn on any of the lights if its possible. Doing so will only cause your puppy to get excited. It could make it difficult for them to fall back asleep. Make the process as quick and quiet as possible so that you and your puppy can call it a night. Late-night potty breaks can do wonders to avoid accidents, stress, and crying. You won't have to do this throughout their entire life. As they get older, you can lengthen the time that they stay in the crate at night until they can hold it all in with no problems. You can control boredom and stress by distracting your dog. You can use a favorite chew toy or some long-lasting treats. Provide your dog with the reward when you put them in the crate or the night. They can then keep themselves entertained until they fall asleep. This method also helps to establish the crate as a comfortable space. By rewarding them each time they go in, they'll associate the confined space with positive reinforcement. Sometimes, the solution to crying is as simple as moving the location of the crate. Night can be a scary time for dogs. Often times, crying is just a way to get some attention and comfort. You can give them some comfort while still providing your dog with the training they need. You can move the crate in your bedroom. You'll be close enough for your dog to see and hear. Your presence alone may be all the comfort they need. If you plan on giving this a shot, you need to do it during the day. Never get up in the middle of the night and move the crate. It can teach your dog very bad habits. Instead, move it when your dog is outside or distracted with something else so that they don't see you. Dogs thrive on routine. They behave better when they know things are going to happen. You'll often find that your dog wants to go outside and eat at specific times of the day. You can set up a nighttime routine by performing the same tasks at the same time every day. Start off by going for a walk after they've eaten. Then, set up a bedtime. 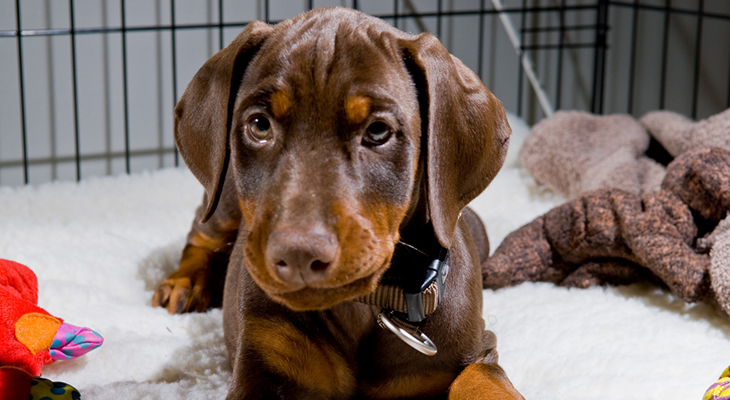 Your pup will eventually get used to the routine and head for the crate on their own. One of the worst things you can do when your pup starts crying in their crate is coddle them. You need to be prepared to ignore their cries for attention. While it can be tough, it's crucial for establishing good behavior as an adult. If you were to run to aid each time they cried, you'd be creating a false sense of reinforcement. They'll start to associate their crying with love and attention. Attention might as well be a reward for a dog. As a result, crying becomes a tool to get what they want. This can be a huge problem as they get older. Before you know it, your dog will be crying every time they want food or whenever they want to go out and play. Essentially, you'll be creating a spoiled dog. To avoid this, invest in some high-quality earplugs and try to get some sleep. Sometimes puppies will get louder if you don't come. Don't break if that happens. Keep ignoring them and eventually, they will learn. Incessant crying is a part of puppy ownership that no one likes to deal with. You can combine these techniques until you find a method that works for your dog. By tackling the issue early on, you can avoid a lifetime of bad behavior.